Dmitry Belosselskiy gives his role debut as Don Ruy Gomez de Silva in Verdi’s Ernani on 20 March 2015 at the Metropolitan Opera New York, conducted by James Levine. Dmitry has already made two appearances at the Met this season singing the Old Convict in Shostakovich’s Lady Macbeth of the Mtsensk district conducted by James Conlon and Ramfis in Aida conducted by Marco Armiliato. 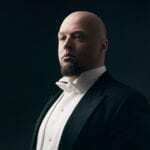 Dmitry will conclude the season singing Oroveso in a new production of Norma at Teatro La Fenice, conducted by Gaetano d’Espinosa, a concert of Rossini’s Stabat Mater in the Leipzig Gewandhaus, conducted by Riccardo Chailly and the summer he will spend in Verona singing in Aida and Nabucco.